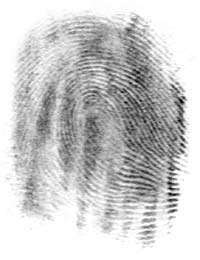 The grooves in fingerprints enhance our ability to sense textures, according to a recent study. Image credit: Wikimedia. Could flashing the "peace" sign in photos lead to fingerprint data being stolen? Research by a team at Japan's National Institute of Informatics (NII) says so, raising alarm bells over the popular two-fingered pose. Fingerprint recognition technology is becoming widely available to verify identities, such as when logging on to smartphones, tablets and laptop computers. Bu the proliferation of mobile devices with high-quality cameras and social media sites where photographs can be easily posted is raising the risk of personal information being leaked, reports said. The NII researchers were able to copy fingerprints based on photos taken by a digital camera three metres (nine feet) away from the subject. "Just by casually making a peace sign in front of a camera, fingerprints can become widely available," NII researcher Isao Echizen told the Sankei Shimbun newspaper for an article published Monday. "Fingerprint data can be recreated if fingerprints are in focus with strong lighting in a picture," Echizen also told Yomiuri TV. He added that advanced technology was not necessary and anyone could easily copy fingerprints. But NII says it has developed a transparent film containing titanium oxide that can be attached to fingers to hide their prints, the reports said. The film prevents identity theft but does not interfere with fingerprints being effective in identity verification, the Sankei Shimbun reported. But the technology would not be ready for another two years, the paper said. $o, Then, Let P.C $niff Your Rear! What The Heck - What's Going on? So they just need to do it backwards like the Brits. I'm sure no one will notice. "But NII says it has developed a transparent film containing titanium oxide that can be attached to fingers to hide their prints, the reports said." Or put on this stuff. Or give up, go home and hide in our houses like Boo Radley.